Over on the FrequentFlyerBonuses.com blog we highlight a quadruple dip mileage earning opportunity by buying Best Western Travel Card. This offer is however from Miles & More (Lufthansa, Austrian, Swiss etc.) and is for buying gift cards in Euros so we didn't have a separate post for it here on RC but you should be able to take advantage of it nonetheless since the Travel Cards can be electronic and sent to your email. You'll have to incur a foreign exchange transaction fee however unless you use a card like the Marriott Rewards Premier Visa card which has no forex fees. You can read all about the offer here. Now, this benefit is being extended to all frequent flyers with the equivalent of oneworld Emerald and Sapphire in any of the alliance member airlines' loyalty programmes when they fly in any cabin class with oneworld member airlines anywhere in the world. Following the launch last year of an additional baggage allowance for the alliance member airlines' most loyal customers - those with the top tier oneworld Emerald status - now cardholders with the next highest status, Sapphire, will also receive an additional baggage benefit. On international or domestic itineraries using the baggage allowance "weight" system - 15 kgs in addition to the ticketed Economy allowance. On international itineraries (including domestic sectors flown as part of international itineraries) using the baggage allowance "piece" system – a second bag, weighing up to 23 kgs, when the ticketed allowance is one bag. On purely domestic itineraries with flights using the baggage allowance "piece" system – the assurance of at least one piece of checked baggage, weighing up to 23 kgs, even when the regular ticketed allowance has no free allowance. Customers travelling in First and Business Class cabins will in most cases receive an even greater free checked baggage allowance. 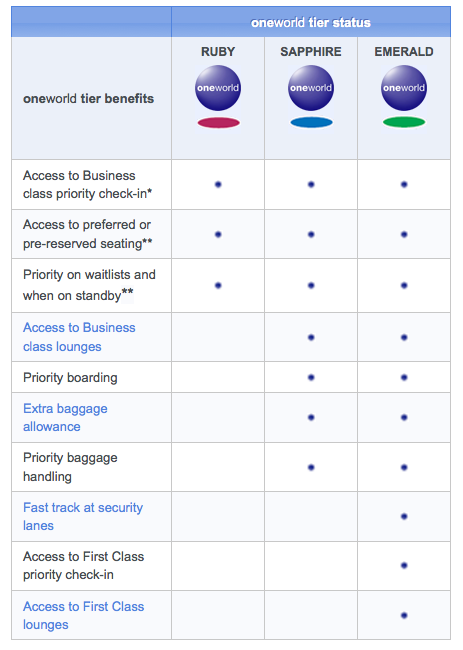 With all oneworld member airlines already granting Sapphire-level members of their own frequent flyer programme an additional baggage benefit when they fly on their "own" airline, today's move extends this privilege to when those customers travel on oneworld partner airlines. 2 Priority baggage delivery is not available on flights operated by British Airways. 3 The Sapphire baggage benefit does not apply to tickets issued using British Airways' "hand baggage only" fares. 4 For domestic routes operated by LAN Airlines, Sapphire cardholders may check in up to two bags with a combined weight not exceeding 23 kgs. Air Canada has a Cyber Monday sale that offers 15% off Tango and Flex fares to anywhere Air Canada flies. Fares must be booked by 11:59pm in your local time zone tonight using promo code CYBERMONDAY. Valid for travel Jan 12 - Jun 15, 15. Find out more here.